Cannabidiol (CBD) is a powerful chemical compound found in cannabis and hemp plants. Studies have shown that CBD has multiple therapeutic properties. For humans, CBD has helped many people who suffer from nausea, pain, inflammation, anxiety, seizures, digestive issues, and plenty more. Unlike the psychoactive tetrahydrocannabinol (THC) compound, CBD doesn’t get the user “high,” but still provides just as much therapeutic benefit as THC. Studies into CBD for pets and dogs are lacking, but there’s some evidence that suggests that CBD could be an effective treatment option for many illnesses in dogs. Pet owners across the world have turned to CBD when nothing else has helped their furry friend. CBD has shown to improve conditions like obesity, irritable bowel syndrome, motion sickness, pain, allergies, seizures, anxiety, and other common medical conditions for dogs. Dog lovers get to choose from a wide selection of CBD products for dogs including tinctures, dog treats, capsules, and topicals like salves and balms. Many dog parents employ the use of CBD oils for dogs in order to improve their pet’s condition. CBD oil can be mixed into food and drinks, as well as applied under the tongue for a few seconds to get the maximum effect. For people interested in the best CBD oil for dogs, here’s a short list to keep you informed. Honest Paws was founded by pet owners who understand the struggle of watching the family dog age. Chronic diseases like heart problems and weak joints can prevent a dog from living their best life. That’s why Honest Paws makes CBD oil for dogs with a strong dedication to quality and safety. Every CBD oil for dogs made by Honest Paws contains natural ingredients that are soy-free, non-GMO, and lab-tested for potency and harmful contaminants. Honest Paws has a 30-day money back guarantee to ensure every customer is happy with their order. Pet owners choose from 3 levels of CBD oils including Level 1 (125mg), Level 2 (250mg), and Level 3 (500mg) bottles. Level 1 is for dogs that weigh up to 25 pounds. Level 2 is for pets between 25 and 50 pounds. Level 3 CBD oil is for dogs over 50 pounds. All level CBD oils are made with 100% full spectrum CBD oil and MCT oil. Customers that order more than $40 receive free shipping. Honest Paws has a rewards program that earns the customer one point for every dollar spent. Points are given just for signing up, liking their social media channels, and referring a friend. The more you buy, the more points you get. The Honest Paws CBD oil for dogs has helped multiple dogs with seizures, arthritis, appetite problems, skin problems, and more. Nuleaf Naturals offers full-spectrum CBD for pets that are safe, legal, and of course non-psychoactive. Most online review sites and testimonials rate them among the best CBD oil products available. 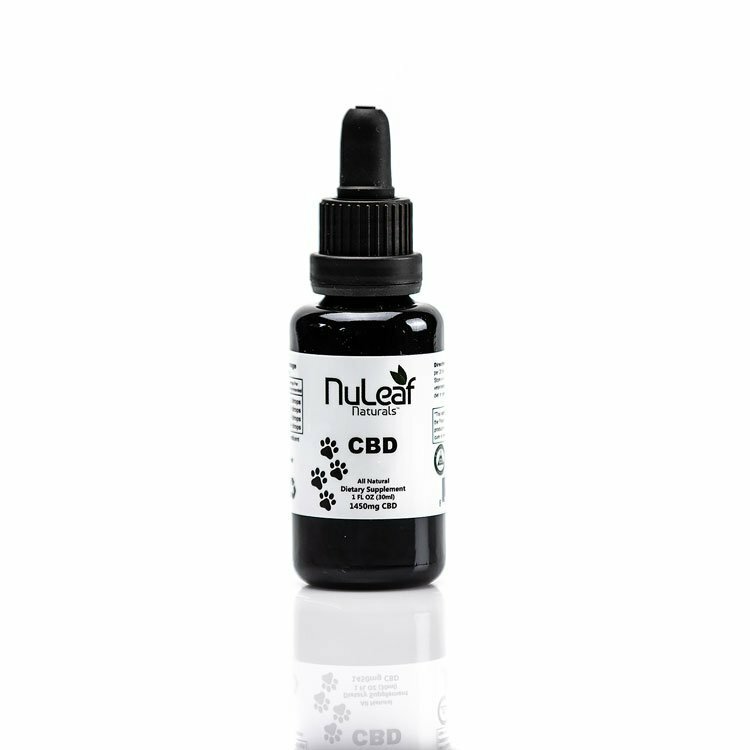 Nuleaf Naturals was founded in 2014 in Colorado, offering organic, non-GMO CBD oil for both pets and people. We've bought and tested their CBD oil which is lab tested for quality and consistency. The main difference between their pet CBD oil is that there's a lower concentration for pets based on their size. Feel free to use the coupon code "CBDNerds" to save 20% on these. From Venica, CA, Holistapet makes full-spectrum CBD oil, dog treats, and capsules. Their CBD oil for dogs is made from organic, vegan, and non-GMO ingredients to ensure that dogs get the safest and most effective product as possible. Holistapet regularly tests their products by a third-party laboratory. Even better, they have a 30-day money back guarantee for all of their products. For a discount, use this 20% off coupon. Holistapet offers a 150mg, 300mg, 600mg pet tincture without additive and preservatives. They’re made with hempseed oil and CBD oil to aid with anxiety, skin issues, arthritis, pain, and more common medical conditions that affect dogs. For frequent buyers, a reward program gives frequent discounts. Thoughtcloud makes organic Colorado-grown CBD hemp oil made with CBD and hemp oil made from seed and stalks. For maximum safety, products are lab tested twice after processing through crude and formulation stages. Cannabis goes through a winterization process that removes wax and fats. Made from cold-pressed hemp, their CBD oil for dogs is gluten-free, vegan, and non-GMO. No pesticides, herbicides, or chemical fertilizers are used. Founded in 2017, Thoughtcloud makes their full-spectrum CBD using a CO2 extraction process using sustainable and virtually waste-free operations. Choose between 200mg, 400mg, and 800mg varieties. Every 200mg is approximately 300 drops total. Get 10% off with a discount code and free shipping on their website. Like many other CBD oil for dogs brands, Thoughtcloud offers a 30-day money back guarantee. CBDfx carries vape juice, capsules, and CBD oil for dogs. Dog owners can get 150mg, 300mg, or 600mg CBD tinctures with lab reports available online. Every CBD oil for dogs contains CBD and a coconut oil base. CBDfx offers customers military and first responder discounts, free shipping, and a 30-day return policy. Frequent shoppers can enjoy their rewards loyalty program. Get a 15 percent off discount by using the coupon "CBDNERDS". Select CBD is prized for its 100% plant-based formula and beloved flavors. For pets, they make a line of CBD drops in many flavors including unflavored, chicken, bacon, and peanut butter. Every hemp tincture bottle contains 750mg of hemp-derived organic and vegan CBD oil. Dog owners can simply add drops on top of food, water, or under the tongue. Select CBD products are solvent and pesticide-free and only contain natural essences for flavor. They offer free shipping on orders over $99 and 20% discounts for life for military personnel and veterans. Customers can get a 30% off coupon for their next purchase when they use code “CBDNERDS.” All products come with a standard 30-day refund guarantee. There are many reputable CBD oil brands for dogs suffering from a host of illnesses from digestive disorders to aggressive behavior. CBD has been known to be a potent anti-inflammatory, analgesic, anxiolytic, antiemetic, neuroprotective, and anticonvulsant compound. CBD oil for dogs can be a powerful tool that can provide pain, phobia, and inflammatory relief. These CBD oils for dogs are tried and true formulas that can help small and large dogs and everything in between.